United Brethren congregations and ministers are encouraged to associate formally and informally with congregations and groups both within and outside the United Brethren church to pursue goals and projects of common interest. There are two primary forms of connections–clusters and associations. a. All National Conference ministers and senior pastors of United Brethren congregations are required to participate in a cluster of their choice for the purpose of maintaining and developing pastoral and congregational health through mutual friendships, coaching, and accountability. b. Clusters are the entities to which all local congregations, preaching points, and ministers are primarily accountable. c. The cluster to which the local church is accountable shall be the cluster in which the senior pastor is a member. a. A cluster typically consists of five to ten (ideally not more than seven) United Brethren ministers and their congregations. b. Groups wishing to form a cluster will present a formal request, including admissions standards, to the Bishop, who possesses the authority to approve, disapprove, or request modifications. c. Non-United Brethren participants may be included in approved clusters. 3. Responsibilities of Approved Clusters. a. Assumptions. 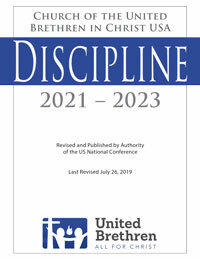 United Brethren participants in approved clusters shall maintain the core values, Confession of Faith, Constitution, and the Discipline of the United Brethren in Christ, USA, and follow all applicable laws, ethical guidelines, fiscal requirements, and sound business practices, so as not to bring disrepute on the cause of Christ. b. Accountability. United Brethren participants in approved clusters shall remain accountable collectively to the United Brethren Church and follow reporting processes to inform the US Bishop and the Executive Leadership Team of its activities and processes. c. Standards. The cluster shall also establish standards and methods whereby its participants can hold each other mutually accountable to maintain the United Brethren commitment to moral character, doctrinal soundness, administrative integrity, and ministry competence. 4. Privileges of Approved Clusters. a. Standards. Approved clusters may adopt group admission standards, setting forth qualifications and assumptions for participation, so long as they do not conflict with the Confession of Faith, the Core Values, the Constitution, and the Discipline. b. Admitting Members. Approved clusters may admit additional ministers and congregations beyond those that sought original approval, provided such members meet the approved admissions standards of the cluster. c. Releasing Members. Approved clusters may release ministers and congregations that desire to join another cluster or that do not maintain the standards, policies, or procedures of the cluster. Released parties are expected to seek membership in another cluster or be assigned to a cluster by the bishop. 1. The cluster leader will facilitate the cluster meetings. 2. The cluster leader will support and resource the pastors and churches involved. 3. The cluster leader will assist in nurturing local church licensees. 4. The cluster leader will act as a liaison between the US Bishop and the pastors and churches involved in the cluster. 5. The cluster leader or his designate will serve on the stationing committee for United Brethren churches in the cluster. All local congregations, preaching points, and ministers may also freely form or join with any association(s) of churches or ministries to pursue goals and projects of common interest (such as church planting projects, local initiatives, joint evangelistic activities, camping ministries, etc.). The Clusters page explains the cluster system, with links to pages about cluster leaders, training videos for clusters, and a listing of all of the clusters.